In the sanctuary layout, the cleansing takes place in the courtyard, the first compartment. In the Holy Place, you have the Table of Shewbread - the One who gave the Bread of Life - God the Father; the Altar of Incense - The Mediator - God the Son; and the Candlestick with oil - God the Holy Spirit. In the Most Holy Place, you have the Tables of Stone - The Law - God the Father; the pot of manna - Bread from Heaven - God the Son; and Aaron's rod that budded with flowers and almonds (just like the ornaments on the candlestick) - God the Holy Spirit. The Law - that is the transcript of God's character, is displayed in the furniture of the Holy Place, and it is duplicated in the Most Holy Place. The connecting link between the courtyard, Holy Place, and Most Holy Place = Is the Cross of Christ - shown in the layout of the furniture. If you look at a human cell, it is also composed of three chambers. The Cytoplasm is the outer chamber. It is also where the "cleansing" takes place. Then you have the Nucleus. This is where the DNA is kept - the Law of the Human body. Then you have the Nucleolus. This is where the RNA is stored - the messenger that carries the law. But the RNA can only be activated by the DNA - so there is also DNA in the Nucleolus. The genetic "glue" that holds the cell together and connects all three chambers is called Laminin - and it is shaped like a cross! We are "fearfully and wonderfully made"! When God created man, He formed the body from the dust (clay) of the earth. Then He breathed the breath of life into the clay form and man became alive. With life in him, man now had the ability to form thoughts, make decisions, etc. When man dies, the reverse happens. The breath of life goes back to God, the body returns to dust, and the soul (life) ceases to exist. Then at the resurrection, God puts the breath back into the clay form and the person comes back to life. A good illustration of this is a computer. You have a computer (body) and it can perform all kinds of functions. You save the memory onto an external hard drive. Then one day, the computer gets destroyed in a fire. So you get a new computer. But the computer doesn't have the ability to remember what the old computer did. That memory is stored in the external hard drive. The hard drive does not have the ability to function like the computer - it just stores memory. But when you plug the hard drive (breath) to the new computer and install the memory on the computer, the computer then "comes to life." Another illustration - A light bulb; The light bulb (body) produces light (soul) when it is connected to electricity (breath of life). If you switch off the electricity (breath) then you have nothing but a dead light bulb (body). When you reconnect the bulb with the electricity you get light again. 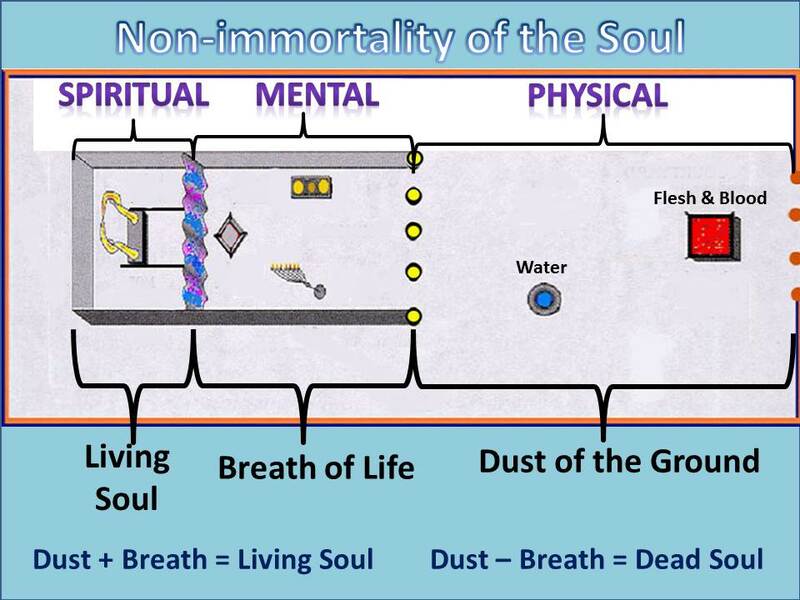 There is no such thing as an immortal soul, God is the only one who is immortal. Immortality is a gift that is given to the redeemed at the resurrection. The first Adam was created perfect, sinless, and immortal (because of the Tree of Life). Then Adam chose to disobey God and he fell from the perfect level he had been created at, to a degenerate, sinful state. The second Adam (Christ) came from heaven and took on the degenerate condition of man and lived a sinless life, to show us that it is possible to live in obedience to God. When we are converted, our past sins are forgiven and removed. As we continue to grow in Christ, and continue our walk with God; we grow closer and closer to Him, and day by day we become more like Christ. When the judgement is finished,then God's people are sealed. Then, when Christ returns, and we are caught up to meet Him in the clouds, He changes our degenerate bodies to new, immortal bodies. That is when we return to the original state that man was created in, and are restored to Paradise and have access to the Tree of Life!